Home Short Cuts Phantastic Ferniture: Bittersweet pain pop vignettes. Phantastic Ferniture: Bittersweet pain pop vignettes. Throwing Muses, Mazzy Star, Belly, The Cowboy Junkies, and Lush. THE SKINNY: Sydney-based trio, Phantastic Ferniture, came together after a raucous, drunken birthday party for vocalist/guitarist, Julia Jacklin, way back in 2014. They played an informal, one-off gig in their hometown of Sidney, Australia, but put off recording a proper album until this year. If you’re fans of shimmering, slightly sad, and personal pop music with an edge and dose of heartbreak, Phantastic Ferniture is for you. It hasn’t left my playlist since I got it. 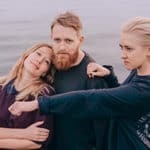 THE DISC CONNECTS: Julia Jacklin, Elizabeth Hughes, and Ryan K. Brennan create music that sounds like it’s from a recently-discovered time capsule of late 80’s, early 90’s female-fronted pop gems. What’s old is new again. Then again, melody, sweet female vocals, catchy hooks, and deeply personal lyrics aren’t date stamped. SELECT CUTS: “Take It Off” features a slinky, syncopated guitar riff and some very personal lyrics that seem to describe a forced and regrettable encounter. Vocalist Julia Jacklin’s voice goes from sweet to tortured and back again. “Dark Corner Dance Floor” features an intro reminiscent of a Franz Ferdinand track and Jacklin’s vocals oscillate from the delicate flourishes of Throwing Muses’ Kristen Hersh’s wounded delivery to the sultry strains of a Hope Sandoval. The riffs and ensemble playing always serves the song and weaves a memorable, haunting melody. Another personal favorite is the swirling, bittersweet melodies of “Bad Timing,” a song that sounds like it could be a forgotten Belly track. As with all Phantasic Ferniture songs, they’re vaguely reminiscent of bands you love and know, but with a fresh, singular, and innovative new take on the idiom. WHY YOU SHOULD CARE: There’s a lot of “product” and fluff on the market these days. It’s a revelation to hear something so raw, personal, shimmering, and real, and capable of breaking through the monotony of all the over-produced, hyped, formulaic, radio garbage that pollutes the airwaves these days. Phantastic Fernitures’ music is a rare thing and an occurrence that must be recognized. Multiple tracks could find a nice place on indie radio and more adventurous FM alternative stations’ playlists. BUY: Phantastic Ferniture’s debut will be available July 27th on Polyvinyl Records Company. If you love late 80’s-tinged and early 90’s dark pop, this belongs in your record collection. If you’re lucky enough to live in Australia, I would highly recommend catching them if they’re gigging near you. Previous PostLesser Glow Proves That Doom Metal Can Be Greater. Next PostBitter Sweet News: BJM's Anton Newcombe on Anthony Bourdain.